Have a movie theater in the comfort of your own home. We can help you pick out the right screen size based on the dimensions of the room & the right projector capable of 3-D resolution quality. Select the right receiver based upon how many channels (speakers) will be distributed throughout the theater (5.1, 7.1, 12.1). Mount in-ceiling or in-wall speakers for maximum space optimization or go with bookshelf or surface mounts that better fit the theme of the theater. 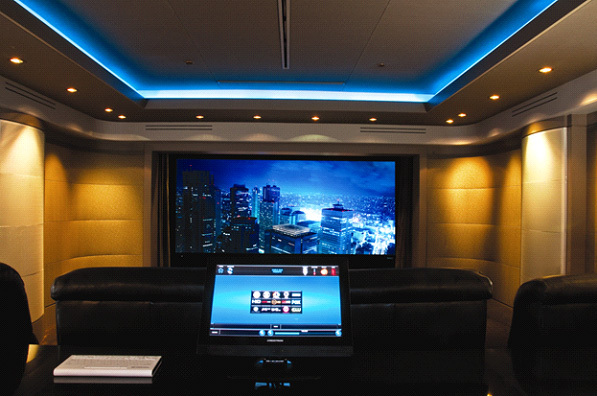 Control the entire room from media center to the lights on the ipad2 for the ultimate movie experience. Sound-proof the theater to eliminate any echoing feedback and vibration that can normally disturb nearby rooms, but also enhance your viewing pleasure. Pick the most comfortable seats based on your preferences and requests. We’ll take care of everything!